Over three months ago, sometime around May, June or July of 2007, my wife and I noticed a hint of the scent of roses in the area surrounding our icon corner in our home chapel. Something made us look at our Cross icon of Christ (located behind our family reliquary), we noticed a small bead of liquid around the side wound on the image of the Christ, where the «soldier pierced His side with a lance». The liquid smelled very sweet, like myrrh. My experience with myrrh is quite limited, my only contact being a cotton ball soaked with myrrh from the Montreal Myrrh-streaming Iveron Icon and several cotton balls of myrrh from the Myrrh-streaming St. Nicholas Icon. We told no one of this and proceeded to «keep an eye» on the icon for any new developments or any possible continuation of the «streaming». The bead of myrrh eventually dried out and we eventually forgot about it. Then in the first week of October, my wife and I were extremely ill and missed Vespers that night. We don’t miss too many of the church’s divine services, so we did take notice of the date, October 6th (Feast day of the Conception of St. John the Baptist). Around 10:30 p. m. that night, I was working in my office, which also doubles as our home chapel where our icon corner is located. My cat walked into the office and began to sniff around as if he smelled something. I did not smell anything. He proceeded to walk toward the area were our family reliquaries are kept. I thought this was strange since he would never go near the reliquaries; amazingly something always stopped him, and he’s a nosy cat. Yet this time he stood on his hind legs and sniffed around, I assume in order to figure out what the smell was. I still didn’t smell anything. I proceeded to pick him up and then I noticed the scent. It was so strong, even overwhelming. Never have I smelled anything like that in my life. I couldn’t explain why I hadn’t smelled it before. It was like a thousand roses had fallen into the room. I crossed myself and guarded myself with the Jesus Prayer. I put the cat down and proceeded to look at the icons. I admit I was afraid to look at the icons near the reliquaries. I finally came to the icon of the Cross and noticed that the bead of myrrh by the side-wound of Christ was still dry, for a split second I regained some composure, even as the smell of roses was getting stronger. I then looked down and my hand was wet — it was myrrh. How did it get there? The icon was dry? Or was it? I then noticed that the left knee of the image of Our Lord was forming a bead of myrrh right before my eyes. I then called out to my wife. She came running, and when I asked her if she had spilled anything on the icons, she said no. She hadn’t gone near them. I showed her the icon. She was in shock. I told her the smell is too strong. Help me look at the other icons. So she did. In my office I have two bookshelves, at the top of them are icons. We have many icons, maybe too many. I stood on my toes to reach for the icons at the top of my bookshelves. My wife did the same. Finally I grabbed the icon of Iveron given to me by Fr. Anatole. It was completely wet. And then the smell got even stronger. Even my wife could smell it. For those of you who don’t know my wife, her sense of smell is very limited; she is only capable of smelling citrus scents. We were afraid. We asked one another if we cleaned or anointed the icons recently, and both of us said ‘no’. ‘What is going on?’ I asked. I put the icons back where they were; we took a few pictures with our digital camera. Then I said an Akathist to the Mother of God in honor of her Iveron Icon and went to bed, or at least tried to. The next Saturday, October 13th, just happened to be «clean the church day». We were preparing our church for the upcoming feasts; our parish feast day (November 24), Christmas, the Serbian bishop’s visit, etc. So my wife, myself and another person were put in charge of cleaning. While we were cleaning the church we couldn’t take our eyes off the two myrrh-streaming icons, which slowly streamed while we were cleaning. The smell of roses was quite pungent. The icons seemed to exude a strong smell of roses. The Icon of the Mother of God seems to smell more like ‘roses’ than the other icon. The Cross has a spicier smell to it. I can’t explain it. While we were cleaning the church, our kumovi, came to see the icons. Not many folks could wait for Vespers that evening. Our Kuma later remarked to me that she’s the ‘doubting Thomas’ and really couldn’t believe it until she saw it for herself. Understandable. She didn’t realize that the icons were actually streaming as we were cleaning. (They don’t stream continuously.) She venerated the Cross and kissed the feet of Our Lord. She got a nice helping of myrrh in her mouth. Like the doubting Apostle Thomas who put his fingers in Christ’s Hands and Side, she put her mouth right in the myrrh, where myrrh wasn’t supposed to be! I couldn’t help but laugh. By the Grace of God, the Holy Cross has slowly ceased to continuously stream Myrrh as it once did, now doing so on certain occasions throughout the year, Pascha being the most recent. What is comforting to the faithful is the Holy Cross still continuously provides a beautiful and pungent fragrance, whether it streams or not. While the «Hawaiian» Iveron Icon of the Mother of God travels and brings the grace of God to various places, the Holy Cross always remains in Hawaii to provide for the protection and veneration of the faithful. 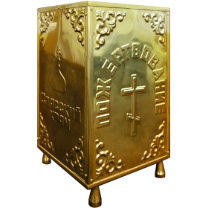 Since June of 2008, the Iveron Icon has been to over 1000 churches in North America of all (canonical) jurisdictions, and has been venerated by millions of people throughout the United States, Canada, Europe and the world. 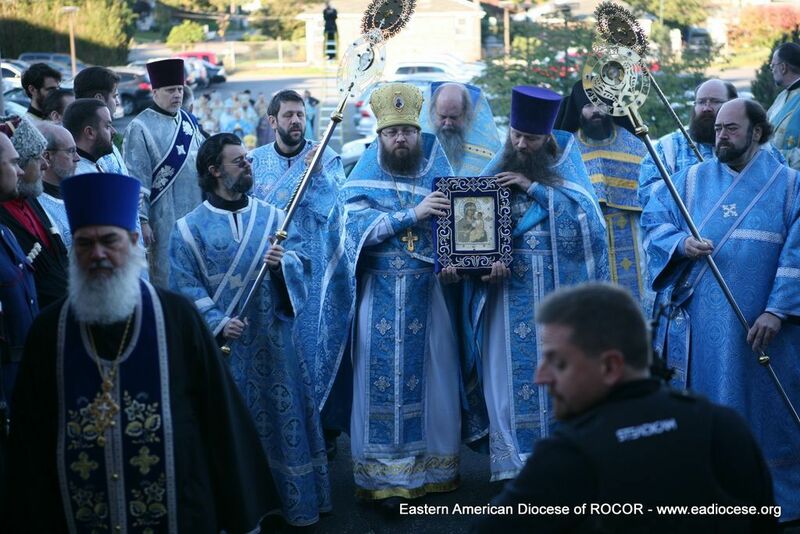 In many cities, the holy Icon is taken from one parish to another, being venerated by all the Orthodox clergy, and helping to establish and heal relationships amongst the Orthodox faithful, and also strengthening and fostering ties between the sister parishes. Requests have now been made for the Wonderworking Icon to be brought to Russia, the Ukraine, Greece, Cyprus, South America, Europe, the Holy Land, Romania, Mount Athos, and Serbia. 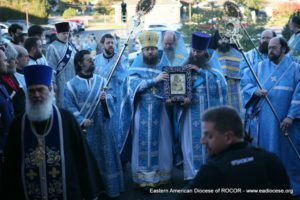 When the Holy Icon was taken to the Republic of Georgia in 2014 at the request of the Catholicos-Patriarch ILIA II of Georgia, over a million faithful came to venerate the «Panagia of Hawaii.» A number of miracles, including the healing of cancer, were reported to the Georgian Patriarchate. If you would like to request Myrrh from the miraculous «Hawaiian» Iveron Icon, you may send your requests to the address provided below. Please also do include a petitionary list of names for the Living and the Departed, these names will be commemorated each week before the holy Icon by Subdeacon Nectarios. The commemoration slips are also permanently kept under the holy Icon. If you are going to send a note or letter, please do indicate on the envelope if it is to go to Fr. Athanasius Kone, the parish rector, or to Subdcn. Nectarios. If a donation is sent, please also indicate if it is to go to help with the care of the Holy Icon or for the parish usage. We have provided various services and hymns to the Most holy Theotokos in honor of Her Iveron Icon. Printing for liturgical use is allowed, but please do not attempt to published these texts without the express permission of the translators, ie the copyright holders.